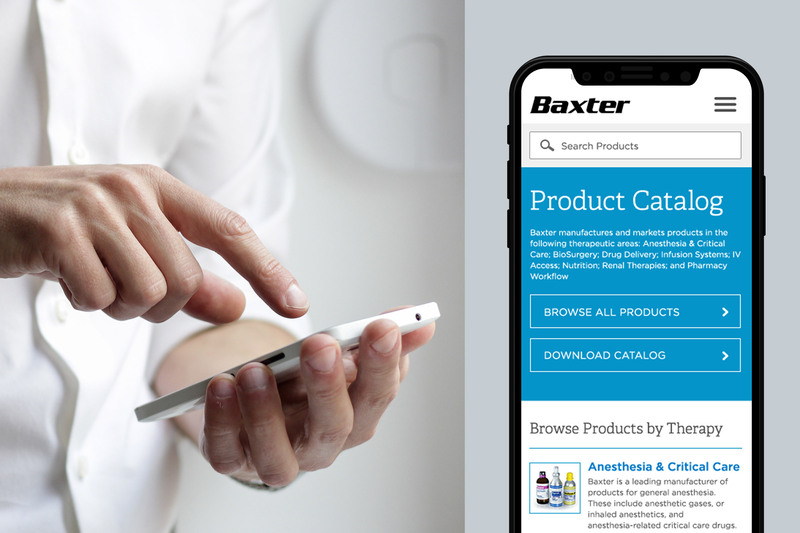 With a catalog of over 2,000 life-saving products for people with hemophilia, immune disorders, infectious diseases, renal impairment, and other chronic and acute disorders, Baxter International had their hands full. An intended user base of internal stakeholders spanning the organization and globe and over ten different customer types across 22 countries made updating the catalog complicated to say the least. 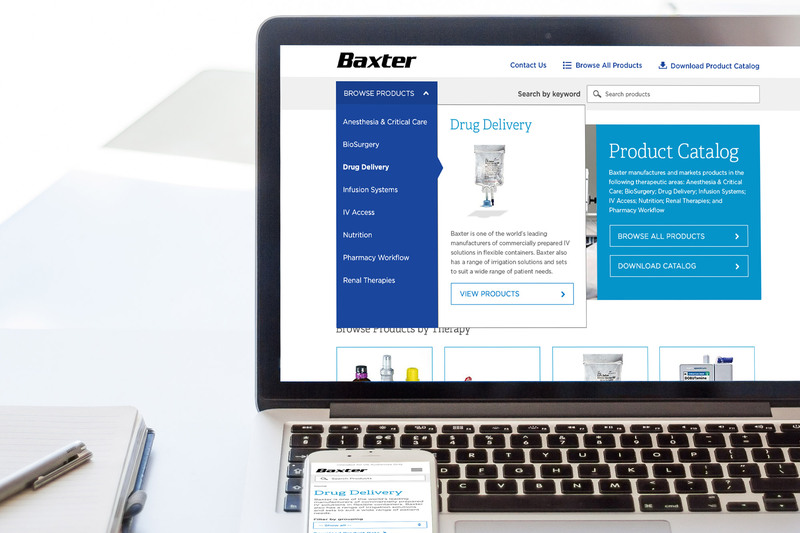 And Baxter’s dated and disjointed catalog experience was no longer delivering value. In fact, it was liability for their entire B2B division. 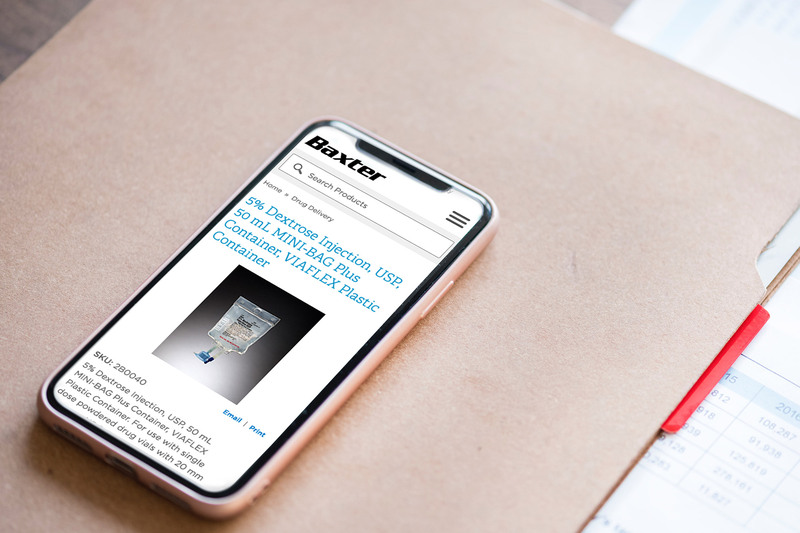 No quick fix could solve these problems, so together with Baxter’s internal IT group, envisionit embarked on a 2 year initiative to bring this tool back to relevance. 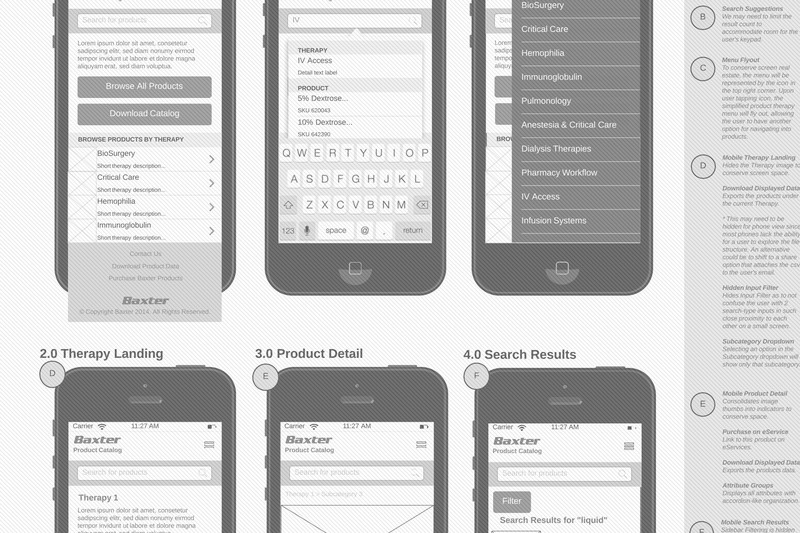 It didn’t take long to recognize that revised wireframes wouldn’t do the trick. The entire user experience required an overhaul from stem to stern — or in this case, from sales to order. We looked at the user journey, beginning with how Baxter’s salesforce used the tool, all the way through to customers placing orders. With a view of this experience, including all the friction and leakage, we were able to develop a business case for a much broader initiative that received the green light from leadership. Sure, we built a bullet proof business case, and provided recommendations and opportunities for improvement across the platform. But in order to execute we recognized the need to garner not only support, but resources, across various stakeholder groups on multiple continents. We drove this effort from the beginning as we worked with our internal lead to build a core project team and a phased roadmap to bring the project to life. Once all the stakeholders were involved (across product, marketing, customer service and IT), we held workshops to establish line of sight on core system requirements and all user needs and, of course, we did it with an eye toward the future. This included supporting Baxter’s global initiative for data integrity across all systems. And we did all this while the company split into Baxter and Baxalta to boot. From sales to customer service, we uncovered how the catalog had been utilized to date and then visualized how the new experience could integrate into these existing processes and infrastructure with ease. We always had an eye towards further enhancing the experience for all parties. 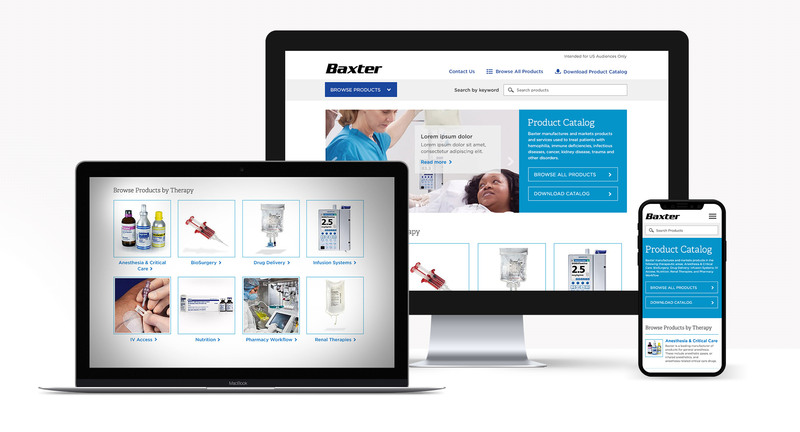 We knew that Baxter’s platform would need some robust ecomm UX cleanup — and it had to work across the world. The customer journey needed some adjustment, too. So we put our UX and customer journey chops to the test and whipped the platform back into shape. We started by providing a foundational structure that was flexible within the bounds of the Baxter brand. The new infrastructure was able to manage and support unique regional issues that pop up from time to time in healthcare. In order to clearly demonstrate the across-the-board improvements, we built a functional prototype incorporating all of the discovery and workshop requirements. The prototype allowed for easy expansion at the navigation level, and intuitive admin management. Keeping the catalog up to date shouldn’t be a burden. Previously, the catalog only served one purpose. But the update provided an opportunity for new calls-to-action and strategic content placement not previously possible. The new catalog is capable of promoting new product lines, over stocked inventory, offering resources, and geo-targeting users. And with an updated dynamic search and a responsive interface, it not did more, but it was easier to use. We consulted on direction and collaborated with the internal IT and marketing team to take the catalog from forgotten tool to contemporary capability. Starting all the way at the business case to launching a prototype to 22 countries (with plans for more), we helped Baxter bring together the stakeholders and create the internal unity needed for such a large undertaking.